This cafeteria went from under 250 students a day participation to over 700. That's almost 300% increase in participation and revenue!! 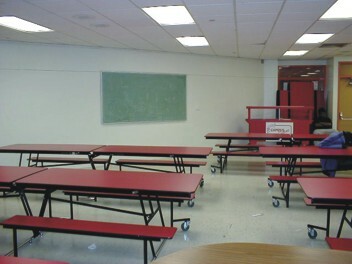 The school used to have fights in the cafeteria. Now, the only fight is to get INTO the dining room. The room used to be a clean neat place for kids to sit. We created a beautiful place for kids to BE! And that makes a world of difference to your students. This place looks like a fast food restaurant with a combination of booths and pedestal tables scattered throughout the room. Logos of the “Red Raider” school mascot inlaid in the tabletops. 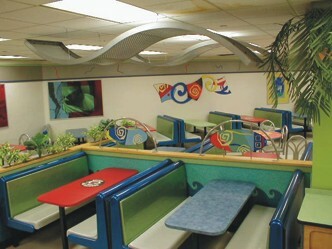 Large hand painted pirate theme art murals around the room. One wall transformed into a “Cabana Hut” overlooking the beach and surf- with a thatched roof cover. A Pirate Ship in the middle of the room with two televisions so the kids can watch highlights of the previous week’s sports activities and student produced programs. A Talking Parrot that is part of the PA system in the school. The Principal makes announcements to the students through this colorful bird. Divider half walls with an ocean wave design to divide the room into different dining sections - just like in a fancy restaurant. 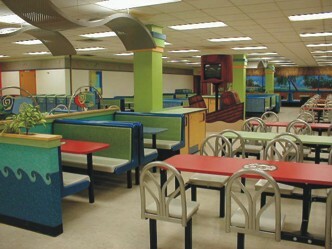 Before: This probably looks a lot like your cafeterias – clean with a place for kids to sit, but B-O-R-I-N-G!!! After: Now the cafeteria grabs student attention! The banners hanging from the ceiling have colorful academic themes, and there are four “Memorabilia Boxes” filled with items from various student groups. They love it as it reflects their school pride! In fact, students from the four groups sit near their box location. “S”-curved ceiling décor adds a whimsical touch to the room. 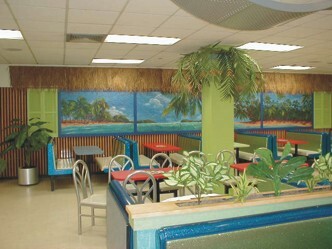 Cabana hut wall art piece with lots of greenery in the room. 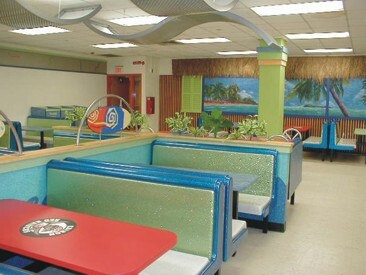 We use a variety of seating styles — booths, cluster seating and individual tables & chairs — to liven up the area.